Smokey eyes are ALWAYS in style, which is one of the main reasons it has stayed to popular over the years. The effect of this look will change your face dramatically, with ability to turn the cutest "girl next door" into a "life of the party" bombshell! Remember that when doing your smokey eye look to keep your hair and eye color in mind, as well as your skin tone. The standard smokey eye colors are, of course black and grey, but don't limit yourself, have fun with it! (^_^) For blue eyes try purple, violet or dark blue shadows. If you're a brown eyed babe like me, spice it up with coffee, copper or golden tones, and for green or hazel eyed beauties play around with purple, dark khaki, dark green, or plum shades! When creating your smokey eye remember to use powdery eye shadows since they're easier to smudge. I also find that using shimmer shadows help create a beautiful fade effect without having to blend a lot. Less work for us = a good thing lol! 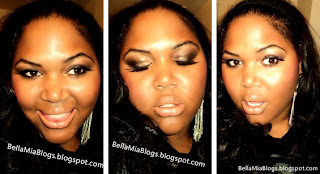 NYX Long Eye Pencil in "Dark Brown"
bhcosmetics 120 Palette 2nd ed. NYX Liquid Eye Liner in "Black"
Maybeline New York Define-A-Lash Mascara in "brownish black"
Ruby Kisses Style Pencil Liner in "black"
CoverGirl tru blend foundation in "tawny #5 sub #465"
Cover Girl tru blend pressed powder in "translucent tawny "
wet n' wild color icon blusher in "Berry Shimmer #834E"
NYX Jumbo Lip Pencil in "Almond"
L'oreal Colour Riche Lipstick in "Dune"
Maybeline Color Sensational Lip Gloss in "Born with It"
Hang with me on Facebook! Be a 4th of July Cutie Pie! Get lost in a Sultry Summer Sunset! Bella Mia Blogs. Ethereal theme. Powered by Blogger.